Christmas Cocktails – a collection of 20 Christmas Cocktails! Cranberry cocktails, sparkling wine cocktails, even eggnog! Something for everyone to make you holidays extra festive! Click here to pin these 20 Christmas Cocktails now! I know you’re busy. Shopping. Decorating. Baking cookies. Well, I’m here to take one thing off of your mind. Holiday Cocktails! 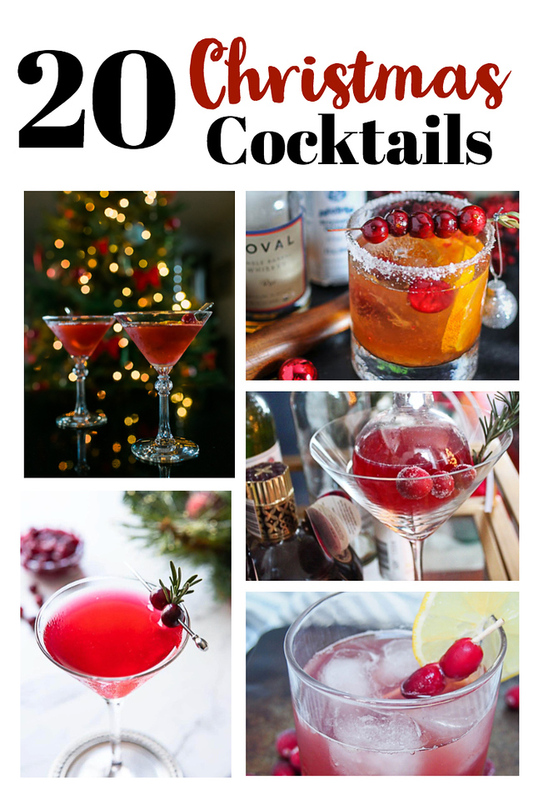 No need to search for the best Christmas cocktails, I’ve collected 20 of them for you! I’ve loosely (very loosely) organized them, to make a bit easier. There are cranberry cocktails, wine cocktails, even eggnog. Something for everyone! This first group of cocktails is all about peppermint and candy cane flavors! I love candy canes and I love finding grown up ways to enjoy them even more! Candy Cane Vodka is a favorite around our house. It is ready in under an hour and makes a great Christmas gift! Wait till you try it in hot chocolate. Hot Chocolate Peppermint Shots from Spabettie. Spiked hot chocolate in an edible peppermint shot glass? Um…yes, please! Holiday Peppermint White Russian from The Forked Spoon. I love white Russians and I really, really love the peppermint spin on these! 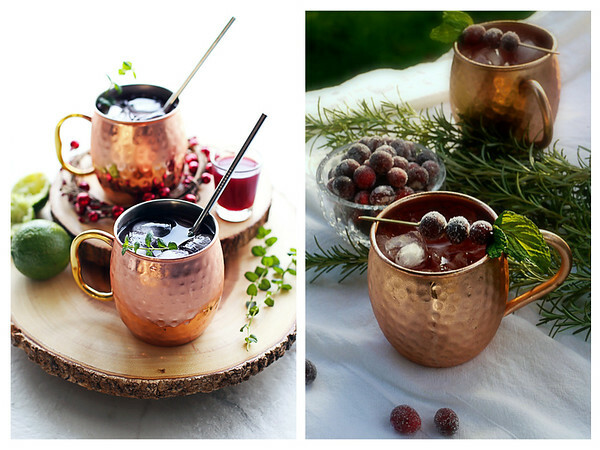 First of all, I need to get me some Moscow Mule Mugs and then I need to make these festive Christmas Vodka Cocktails! Pomegranate Honey Moscow Mule by Yay! for Food! I can not wait to try this pomegranate and honey spin on a classic Moscow Mule! Spiced Cranberry Moscow Mule by The Good Hearted Woman. The spiced simple syrup in this cocktails sounds amazing and I can imagine using it in soooo many other cocktails too! I’m sure it comes as a surprise to no one, that we have a lot of Cranberry Cocktails. I love cranberries and hate that they only seem to be available around Thanksgiving and Christmas. Not to worry though, I have 5 bags in my freezer so that I can enjoy them anytime I want! First up we have one of my favorite cranberry cocktails, a Cranberry Manhattan. I love this festive twist on a classic! Speaking of festive twists on classics, this Christmas Old Fashion from Gastronom sounds amazing!! I will be sipping a few of these while decorating the tree! This Cranberry Whiskey Sour from Caroline’s Cooking is another festive classic!! I love all the festive twists on my favorite classic cocktails! I am a gin girl, so this Gin, Cranberry & Thyme Cocktail from Lemon Baby is a must for me. So elegant!! Go look at how she serves it! Thanks to Communal Table for introducing me to a new-to-me cocktail – The Cape Cod Cocktail! So elegant! I’ve collected a lovely assortment of wine cocktails for you, some sparkling wine and some sangrias. I think I’ll just have to try them all! This Winter White Sangria from Muy Bueno is so pretty and festive! I’ll be taking some to a friend’s Christmas party, I’m sure it will be a hit! Looking for something for Christmas and/or New Years? Then you will love these two sparkling wine cocktails – Apple Cider Champagne Cocktail from Whitney Bond and this Cranberry Aperol Spritz from Supper in the Suburbs. Don’t worry red wine lovers, I’ve got you covered with Holiday Cranberry Sangria from Sue Bee Homemaker and a Cranberry-Apple Cider Sangria from Burrata and Bubbles. Nothing better than sitting in front a fire, sipping a little brandy cocktail. Right?! Love the flavor combination in this Donner and Blitzen a Ginger Brandy Cocktail from Beyond Mere Sustenance. And for those of you that want to preserve a bit of the Christmas spirit, we have Brandied Cranberries and a Winter Solstice Brew! 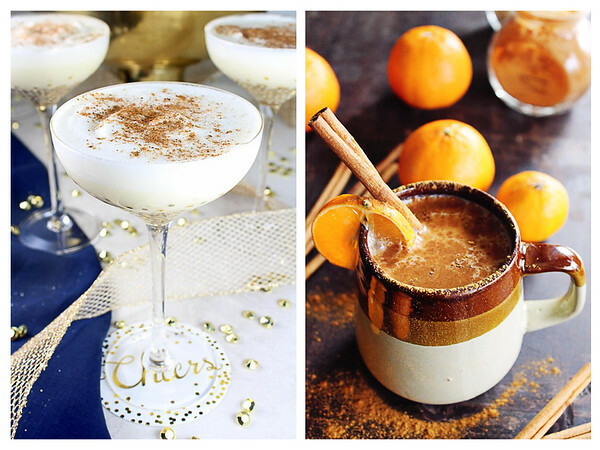 I finish up this amazing roundup of festive Christmas drinks with two creamy cocktails. You have to go check out this Nutty Holiday Eggnog from Taste and See to find out the ingredient that makes it so special! Last but not least, is the perfect curl up by the fire drink, this Almond Milk Chai with Whiskey from Rhubarbarians. Warm and cozy, the nightcap for this wonderful round of cocktails! 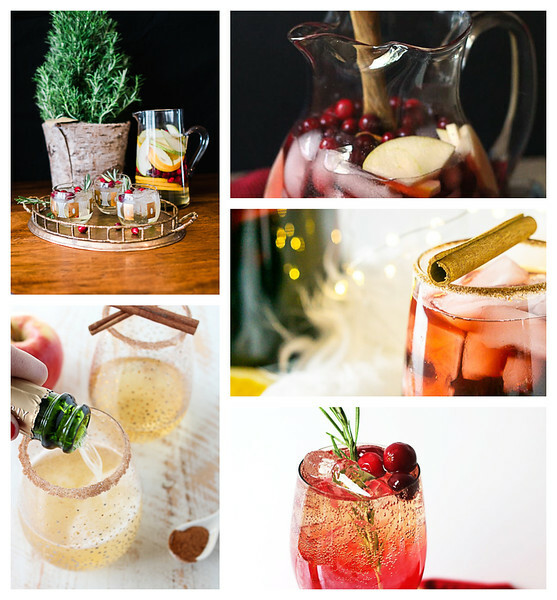 Thanks so much for including my cranberry, gin, and thyme ornament cocktail! Cheers! You’re welcome, it sounds amazing! Yay – Pam to the rescue!! I’m thinking a Cocktail Advent Calendar. Not sure about eggnog though. It looks like custard or that Dutch liqueur – Advokaat. Will welcome feedback on the eggnog experience. I love your idea of a Cocktail Advent Calendar! I know, I’m going to try them all! This post is making me thirsty! There’s so many delicious and festive cocktails here! I can’t wait to starting trying them! Thanks for sharing your sangria recipe with me! Awww… thank you so much for including my cranberry and vodka cocktail! I’ve found at least 10 new cocktails I have got to try – woo hoo! 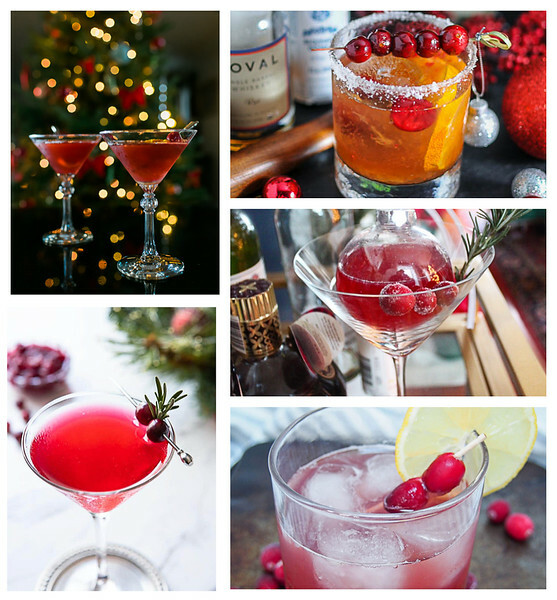 This is such a fabulous round up of holiday cocktails!! I know, I want to try them all! Thanks for including my brandy cocktail Pam! The cocktails are all so beautiful, and I know they’re just as tasty! Pinning (and hope I remember to make a few)… Merry Christmas! Thanks for sharing your cocktail with me!